The Next Generation featuring a host of engineering innovations. The 4.5L series establishes new standards for power-to-weight ratio, driver experience, acceleration, durability, and ease of maintenance. A new V6 engine that delivers V8 performance in a compact lightweight package. 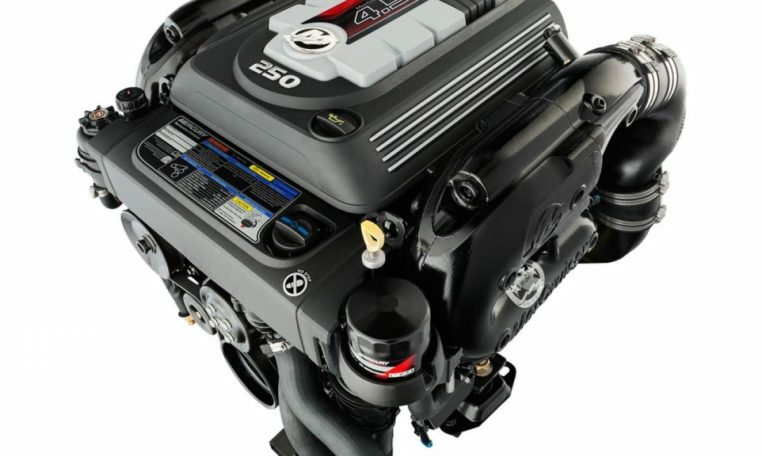 Designing a V-6 block solely for marine use allows Mercury to build the 4.5L with the ultimate protection system, using cast-iron componentry where the engine intersects with seawater, and using corrosion-resistant aluminum and composites everywhere else. The MercFusion Paint System creates an outer seal against the elements, while MerCathode® provides automatic protection against galvanic corrosion. For maximum defense against saltwater effects, the SeaCore® industrial hardcoat anodizing system and closed-cooling circuit is available with the Bravo® drive. The 4.5L comes standard with Adaptive Speed Control, which automatically maintains engine rpm regardless of load or water conditions. The result is increased throttle response and a sporty feel. Thanks to its new, long-runner scroll intake manifold which draws in more air and converts it into additional torque, the 4.5L delivers a ground-breaking power-to-weight ratio and gives you V-8 power in a V-6 package. The 4.5L’s newly designed rear-facing throttle body, anti-whistle throttle plate, engine cover and mounts, lightweight flywheel, fuel-supply module, and structural oil pan all work together to deliver a superior idle, smoothness and low vibration. Resulting in an exceptional driving experience.